The backdrop for this lack of confidence in communications security is low levels of trust in key sectors that Americans associate with data collection and monitoring. While the surveillance practices of government agencies have been the focus of many public discussions and debates post-Snowden, previous research from the Pew Research Center’s Internet Project has suggested that Americans are also concerned about data collection by advertisers. Additionally, public concern over the amount of personal information businesses are collecting has been growing. Currently, just 18% of adults believe that the government in Washington can be trusted to do what is right either all (2%) or most (16%) of the time, while another 67% say that the government can be trusted only some of the time and 14% say it can never be trusted. As has been the case in other surveys, there are significant differences by education level, as adults who did not attend college are more likely to say the government can “never” be trusted (21%) compared with those with at least some college experience (9%). 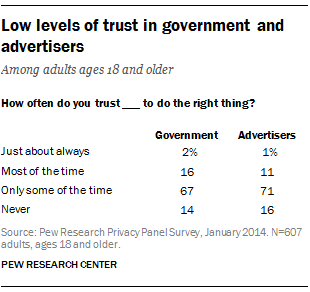 However, Americans do not trust advertisers any more than they do the federal government. Few respondents believe that advertisers can be trusted to do what is right just about all (1%) or most (11%) of the time; 71% say that advertisers can be trusted only some of the time, and 16% say they can never be trusted. There are few differences in adults’ trust levels toward advertisers by demographic group, with the exception of household income: 27% of those living in lower-income households (earning less than $30,000 per year) say that advertisers can “never” be trusted, making them more likely to say this than those living in higher income households. Similarly, 80% of social networking site users on the panel say that they are at least somewhat concerned about third parties such as advertisers or businesses accessing some of the information they share on those sites without their knowledge; this includes 35% who say they are “very concerned” and 45% who say they are “somewhat concerned.” Another 17% say they are “not too concerned,” and just 2% say they are “not at all concerned.” In contrast to many other questions in the survey, there were only minor variations by age, education, or household income. Beyond social networking sites, Americans express a broader loss of control over the way their personal data is managed by companies. Fully 91% of adults “agree” or “strongly agree” that “consumers have lost control over how personal information is collected and used by companies.” This includes 45% who “strongly agree” and 46% who “agree” that consumers have lost control. Another 6% “disagree,” while only 1% “strongly disagree” with this sentiment. Respondents who are more aware of government surveillance programs also express a greater loss of control over how their personal information is collected and used by companies. Those who said they had heard a lot were more likely to “strongly agree” with a loss of control over their personal information compared with those who had heard “a little” or “nothing” about surveillance programs (58% vs. 37%). Support for more regulation of advertisers is consistent across an array of demographic groups. However, those who have a college education are more likely than those who have not attended college to support more government intervention (69% vs. 58%).